Early Childhood Educators agree that activities that are genuinely enjoyed by children promote learning. Building with lego, experimenting with playdough, organizing games and listening to music, for example, provide children with learning experiences that create connections in the brain and contribute to a strong foundation of knowledge. Knowing that my musical melodies are enjoyable for children is of paramount importance to me–my goal is to capture their attention with music, so that they will absorb the concepts and information embedded within my songs naturally and easily. Short, to-the-point lyrics, paired with catchy musical “hooks” easily teach specific information to babies, toddlers and young children, whether the focus is the vowels or all 50 United States. We have all had a melody stick in our minds at one time or another, and know that once a melody sticks, the lyrics/content stick along with it…the more you think about it, the longer it sticks! 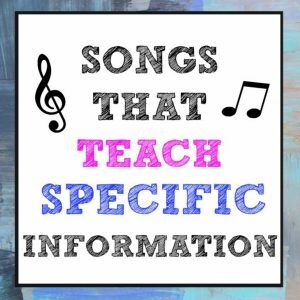 Whether you’re a teacher using these songs to teach at Circle Time or a parent/caregiver playing them in the car, I guarantee that your little ones will easily absorb the information embedded within my catchy, easy-to-learn songs. (These links all point to www.cdbaby.com, but you can also download my songs/albums from iTunes here).